Good day fellow Disney lovers! I am back with another food post! I had the opportunity to spend a few days with some friends from the States and they mentioned the lack of breakfast options at Tokyo Disney Resort. I am here to say that there ARE breakfast options, just maybe not options that are appetizing to some people. I grew up in an American family and I love my waffles, pancakes, omelettes, sausage, and crisp bacon as much as I love Japanese cuisine. Unfortunately, American-style breakfasts aren’t a huge thing here unless you can find a Denny’s (or other family restaurant) nearby. This was a few weeks ago, but as always we arrived an hour or so before opening and it was still cold enough that we decided that we didn’t want to wait in line so we headed over to MiraCosta for breakfast. It was a weekend right around spring vacation, but I felt that the lines weren’t any longer than usual. I’m sure this was because both parks were in-between events, though I think a lot of people were cramming in park trips before the price raise! Sakura (cherry blossoms) in full bloom! I’m sorry this isn’t a very artistic shot, but you can see how beautiful they are! The picnic area is just under here so it would have been an ideal day to buy some food and sit outside, except for the chilly weather. Brrrr! MiraCosta! Some day I want to stay in a harbor view room! We decided to head to Oceano even though hubby is a fan of BellaVista Lounge because of the nice view. I found that Oceano has a fuller menu compared to BellaVista. Hubby was happy to find that they served Japanese dishes, because who doesn’t want to have fish for breakfast? ;D I kid, I love both Japanese-style and American-style breakfasts. 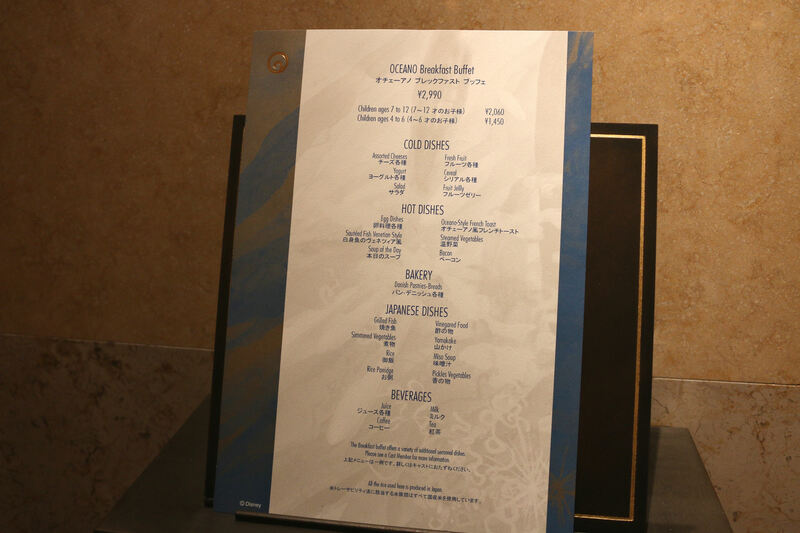 You can click on the photo above to take a closer look at the menu. What was most exciting to me was the fact that I got to see a sneak peek of Fashionable Easter! We got to see a rather large chunk of the show while they rehearsed before the park opened. I was most excited to see the vibrant kites! I’ve missed them so much since The Legend of Mythica ended. The kites and music were my favorite part! Thankfully, Fashionable Easter has both kites and good music. Anyway, on to the important part. I started off with the hot dish side and ended up with eggs, bacon, sausage, tomato macaroni, and chili with some bean dip. I’m sad to say that I can’t remember what that little square on the left was. I think it was a quiche like cube. My second plate is kinda random with a little bit of egg from the Japanese side and then some potato salad, cheese, yogurt, and salami from the salad bar. That’s the great thing about buffets though, right? You can eat whatever you want! They also had a large selection of breads and some cereals. Hubby jumped into the Japanese dish side and returned with this. Egg, kinpira vegetables, grilled fish, okra, and simmered vegetables. Okay, so maybe not exactly what I would eat for breakfast, but other than the okra it all looked pretty good to me. He also got some soup. I see carrots, green onions, and fried tofu. Don’t let that scare you, it’s really good! I didn’t get to snap any photos of the food because I’m a chicken, plus there were a lot of guests moving through! The interior was really nice though. Definitely ocean themed and slightly reminded me of the Mermaid Lagoon. Lots of windows facing the harbor, just not a big window like BellaVista. There seemed to be plenty of seating and while we didn’t get a window seat, we got to sit pretty close to the food and I would say that’s a win-win situation for both us and…the food? Honestly, I have no clue what this is suppose to be. Sea plants? Shells? I don’t know, but it looked pretty cool to me. By the time we were done eating the park had opened and everyone was rushing towards Toy Story Mania. Now that would be a fun and delicious adventure! Such a pretty hotel. I’ve not been able to save up for a Japan visit yet, but I would want to eat japanese food if I were there. When I went to Mexico, I ate Mexican food. It’s the easiest way to get a small peak at life from wherever you are visiting, I think. Plus, we have a few good Japanese resteraunts here, but many if them have americanized versions of Japanese dishes and I know the real thing would be so much better! I love MiraCosta! Someday! I’m sure most of the Italian, Chinese, Korean, and other foreign foods we have here are not authentic at all. I’m totally used to it, but I know that a lot of non-Japanese people find it weird that the pizza here has corn on it. I thought the corn on pizza was odd at first, but I love corn and now think it would be good. Ha.